Julian Scott started his career at the BBC where he worked on the Corporation’s flagship national, and international broadcasts. Julian moved to the production agency Imagination as one of the original pioneering team. He worked on product launches helping to grow the company from 10 staff to over 600 building one of the largest creative audio and music departments in the UK. He left in Imagination in 1990 to concentrate his efforts on composition and sound design, and has continued to build his reputation receiving international acclaim for diverse work encompassing major exhibitions for example Hollywood Costume at the V&A, London and the Academy Museum, Los Angeles, projects for global corporations including Ferrari, British Airways and Coca-Cola, public events such as the G8 summit and the opening of the Channel Tunnel and top tier international sporting events including the 2004 Olympic Opening and Closing Ceremonies, the 2008 Be the 2002 Commonwealth Games and the 2008 Tour De France. 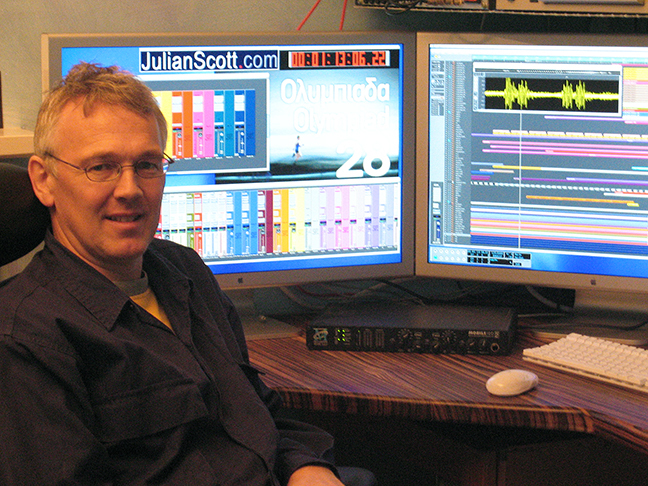 Julian’s breadth of experience means he is equally at home scoring for The Royal Philharmonic Orchestra and overseeing recording at Abbey Road Studios as he is developing unique soundtracks, using state of the art computer resources in his own studio.